Shaken Baby Syndrome (SBS) is a term used to describe the signs and symptoms resulting from violent shaking or impacting the head of an infant or small child. This newly recognized form of abuse has devastating consequences and can lead to serious brain injuries that occur whenever an infant or toddler is violently shaken. SBS continues to be a growing concern with more than 80% of incidents occurring in new parent households that have no previous history of abuse. This tragic consequence is usually associated to the #1 trigger - crying. Simple techniques can be used to prevent this overwhelming form of abuse. SBS: 101 “Don’t Shake Take A Break!™” is a new resource tool for preventing Shaken Baby Syndrome. This resource offers education on the symptoms, triggers, coping techniques, and consequences associated to SBS. SBS: 101 is a magnet that may be used to record your child’s vital information and contains simple techniques for preventing Shaken Baby Syndrome. Remember Don’t Shake Take A Break! For more information on SBS see www.dontshake.org or to learn how to obtain SBS: 101 call 1-800-798-1575. 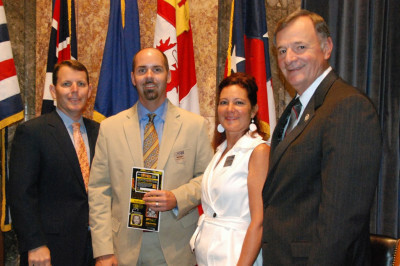 Senator Jody Amedee along with Senator Ben Nevers and Senator Julie Quinn co-authored Senate Resolution SCR 29 designating May 26th, 2011 as Shaken Baby Syndrome Prevention Day in Louisiana in honor of Rey Wayne Gatlin. Shown at right is Senator Jody Amedee, Child Advocacy Services CEO Rob Carlisle, CAS Director of Community Outreach Michelle Gallo and Senator Ben Nevers. Don't Shake Take A Break!